DALLAS, March 23, 2017 /PRNewswire/ — Pie Five Pizza Co. is ready to help its guests feel the burn. Beginning Tuesday, March 28, the fast casual restaurant known for its customizable pizzas is heating things up with its newest limited-time creation – The Pie-Ferno Pizza. Guests looking to put some punch in their lunch (or dinner) will love this new spicy sensation. The Pie-Ferno is a flavor explosion featuring spicy Sriracha marinara, mozzarella and cheddar cheeses, zesty pepperoni and flaming banana peppers. 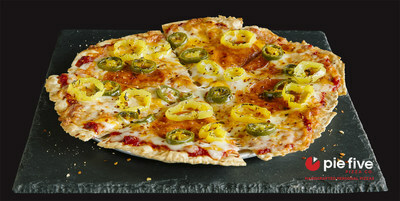 As if that’s not hot enough, it’s topped off with jalapeños and crushed red peppers. It’s available on one of Pie Five’s made-from-scratch crusts including Crispy Thin, Classic Pan, Traditional Italian and Gluten-free. Get it while it’s hot. The Pie-Ferno Pizza is only available until May 14.